After 10 years of living abroad, Daniel Gutierrez finally made it back home. 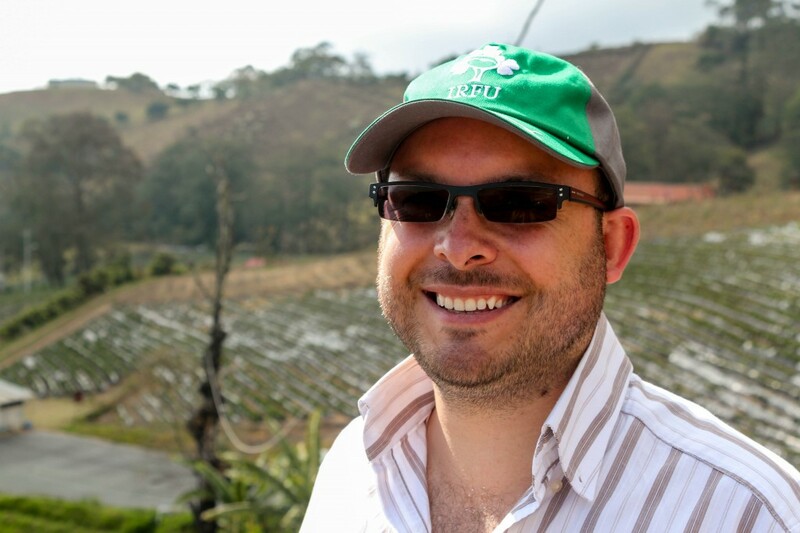 A few years ago, being part of operating a family farm in Costa Rica was the farthest thing from his mind; developing software for banks doesn’t usually lead to dreams of growing fruits and vegetables on the side of a mountain. After 10 years of living abroad, Daniel Gutierrez finally made it back home. A few years ago, being part of operating a family farm in Costa Rica was the farthest thing from his mind; developing software for banks doesn’t usually lead to dreams of growing fruits and vegetables on the side of a mountain, but the curvy roads of destiny can sometimes lead to the most unexpected places. Recently, Daniel gave my daughter, Maya, and I a tour of his family farm and hometown of Cartago, a suburb to the east of San José. We started with lunch at Daniel’s favorite restaurant, Mi Tierra, a restaurante tipico, over-looking Irazú Volcano–Volcán Irazú to locals. He explained that the volcano is as much a part of the land as are the farms and farmers of Cartago, a traditionally agricultural area. “In Cartago, you always know which way is north. Just look for Irazú ,” he said. The volcano is hard to miss. At an elevation of 11,260 feet, this active volcano is the highest mountain in Costa Rica, and the tallest of the four volcanoes that make up the Cordillera Central, a corridor of mountain ranges consisting of four volcanoes: Poás (8,885ft), Barva (9,534 ft), Irazú and Turrialba (10,958 ft). On a clear day from the uppermost point of Irazú , you can see both the Caribbean and Pacific oceans. Not a bad accomplishment for one day’s hike. Between the town of Cartago and the famous volcano lies the Gutierrez family farm. It is nestled on the side of a hill in the small town of Llano Grande, located at an altitude of approximately 6,500 feet. Daniel explained that most of the food grown on their farm stays in Costa Rica for local consumption. 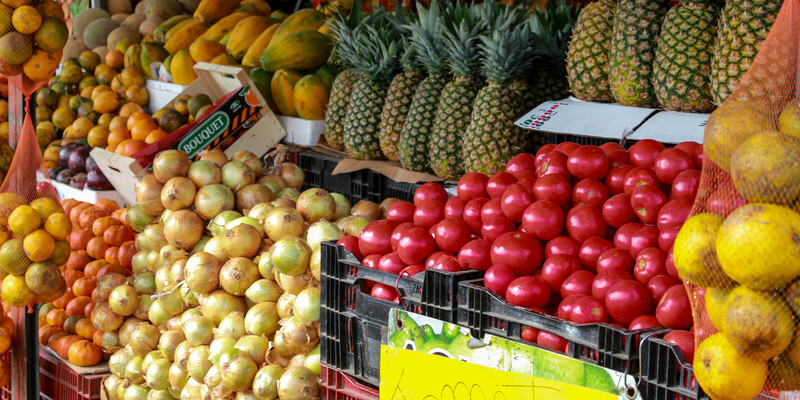 The produce from the Gutierrez farm is sold directly at local markets—ferias–through local merchants, to restaurants, and to small street vendors and local grocery store chains. 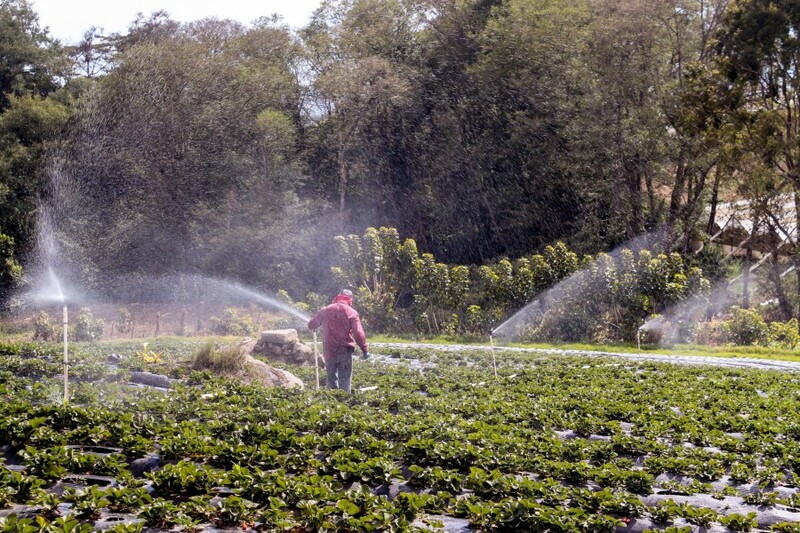 A farm hand working with the sprinkler system in the strawberry field. “The restaurants really like our strawberries because they’re so sweet. You don’t have to add any sugar to them,” Daniel said. Today, the farm is owned and operated by Daniel, his brother Carlos and his father, Carlos Sr. “My father is supposed to have one-third of the power, but he is my father,” he says with a laugh. Meaning that, even when he and his brother have a differing opinion, his father’s decision wins the day. Not that they mind too much, seeing as how Papa Gutierrez has been selling agricultural supplies to local farmers for about three decades and they appreciate his knowledge and experience. 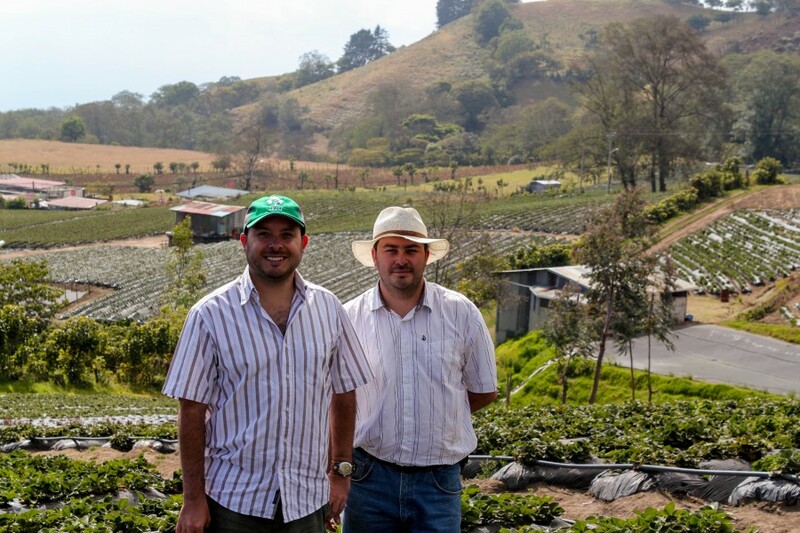 Brothers Daniel and Carlos Gutierrez, along with their father, own and operate this Costa Rican farm outside of Cartago. According to Daniel, his younger brother, Carlos, has a natural green thumb and possesses a true love of growing things. Coming from a business background, Daniel takes care of the numbers side of the farm but is learning more about farming every day. “When I first started coming to the farm, I felt really useless. I’ve asked a lot of questions in the past seven months,” he remarked as we walked through the strawberry field. 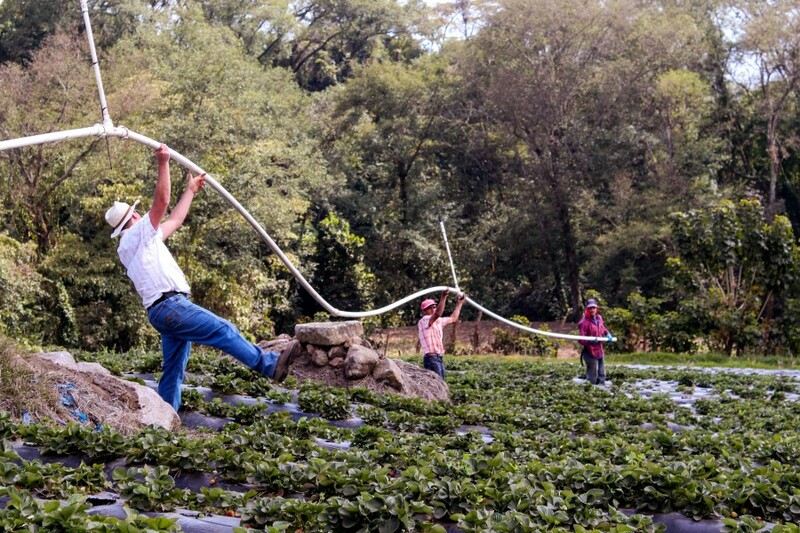 The hands-on grower in this partnership, Carlos Gutierrez works with the farm-hands to set up the sprinkler system. The focus on the farm this week was on the strawberries. Each row of strawberries was slightly terraced and covered in black plastic to help keep the weeds and pests at bay. The hard work of the farm is done in the morning: starting at 5:00am and ending in early afternoon, before the heat settles in. By the time we arrived after lunch, the strawberries had already been picked and delivered to the market. 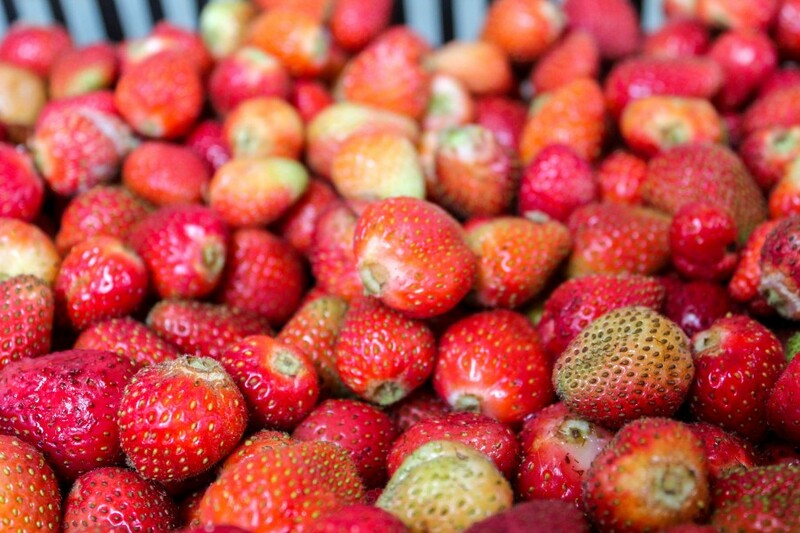 A produce vendor in Cartago buys strawberries and vegetables from Daniel’s family farm. After we had our fill of strawberry fields, we made our windy way back down the mountain to Cartago. Daniel made a quick delivery to a local produce vendor before we headed to our next stop: Basílica de Nuestra Señora de los Ángeles (Our Lady of the Angels Basilica). 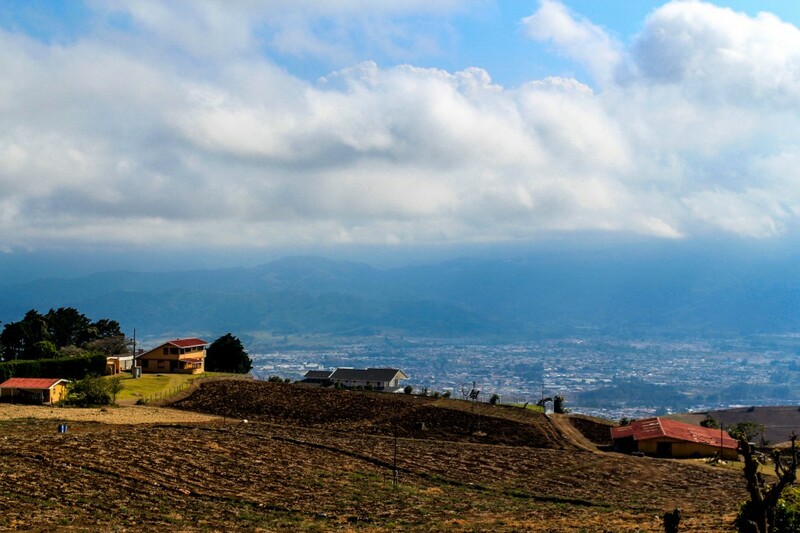 The view of Cartago as we come down the mountain from Llano Grande and the farm. The Lady of the Angels Basillica is named after a small, stone representation of the Madonna holding the infant Jesus. The statue is dark in color and is sometimes referred to as La Negrita, or the Black Madonna. The Virgin of the Angels is the official patron of Costa Rica. 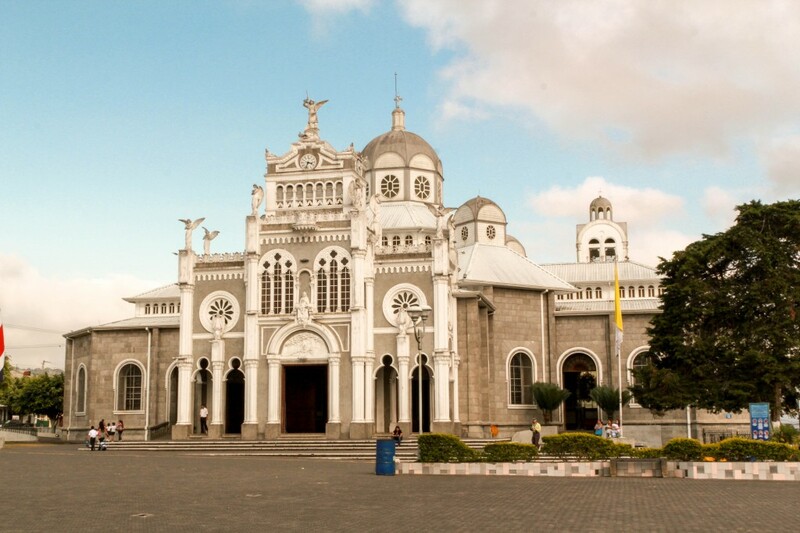 The Basílica de Nuestra Señora de los Ángeles in Cartago, Costa Rica. According to the story, in the 17th century a local, native girl discovered the statue on a large rock and took it home with her. When she awoke the next day it was gone, finding it again on the same rock where she discovered it. She then took the statue to a local priest who locked it up in a box. The next day, it was missing from the box and was again discovered sitting atop the large rock. The basilica was finished in 1639 and is now located on the same spot where the Madonna was originally found. The original rock is considered holy and is underneath the church where it can be viewed by visitors from a safe distance. In this same area under the church is a spring, believed to possess special healing powers. While we were there we witnessed many people filling up large bottles of water from the spring to take home. They save the water to give it to sick friends and family as needed. The water that flows under the basillica is considered holy. It is taken home for future use to promote good health and aid in healing the sick. Every August, over 2 million people from all over Costa Rica make a pilgrimage to the basilica to request a special favor of La Negrita. Most people start their journey from their home, wherever that may be, the very devout even making part of the journey on hands and knees. Many people who come on the pilgrimage bring a trinket or some representation of their request to leave for the Madonna. Inside the church are display cases holding thousands upon thousands of these requests in physical form: tiny babies, arms, legs, hands, and feet, beds, houses, cars, and planes. Through the years, people have also left letters to the Madonna; testimonials to the healing and special protection they experienced after holding up their prayers to La Negrita. 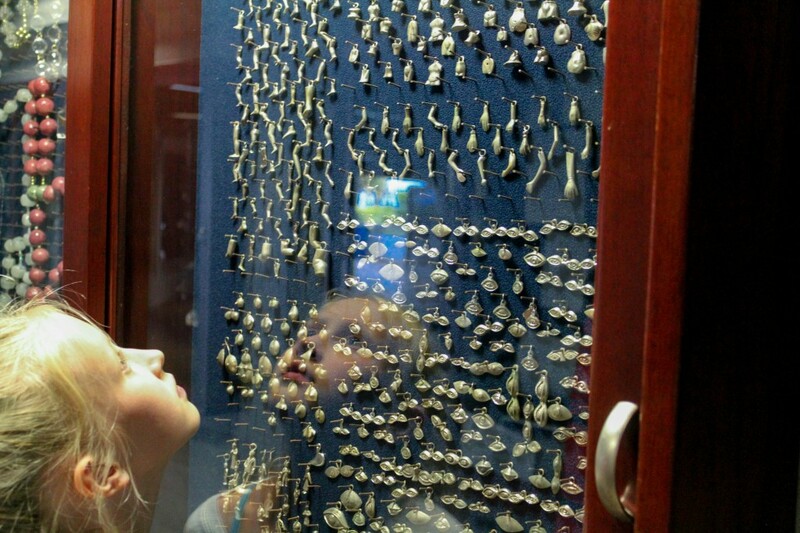 Maya is amazed at all the trinkets brought by pilgrims, the prayers and hopes of the people of Costa Rica, hanging in the glass cases at the Basílica de Nuestra Señora de los Ángeles in Cartago. How does it feel to be home in Costa Rica after spending 10 years away? “It felt great to come back,” he said, with a huge smile. After living abroad for 10 years, Daniel is happy to be home.